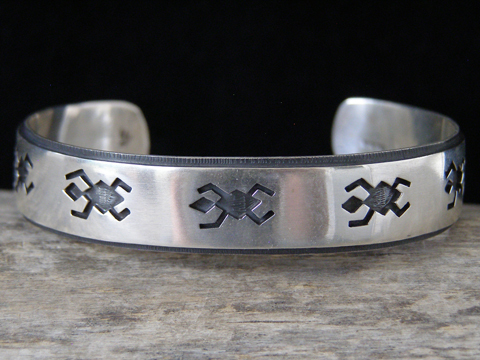 Nathan Fred Hopi Overlay Turtle Bracelet size 6 7/8"
Hopi silversmith Nathan Fred made this fine overlay bracelet which shows a band of stylized turtles moving across the surface. It's a nice detail to leave the edges of the cuff uncovered by the overlayer and texturing and oxidizing them. This bracelet actually has some flex, so it's possilbe to open it a little to put it on and it will spring back to shape with a smaller gap. Hallmarked NF and stamped Sterling inside. Total inside circumference (including gap): 6 7/8"